An eco-settlement has won the right to stay on land in south Devon for another three years. The Landmatters co-op moved to the spot near Totnes without permission two years ago, where they live in makeshift shelters and grow their own food. Their case went to the planning inspector after South Hams District Council refused retrospective planning permission and ordered them to leave. The inspector said the potential value of their lifestyle outweighed any harm. Government planning Inspector Alan Woolnough granted planning permission for the settlement subject to the "low-impact" criteria in the planning application. In his report, he said Landmatters had already achieved low energy consumption, implemented recycling and had an ecological footprint far smaller than the regional average. Rooh Star, of Landmatters, said they were delighted to be able to continue to develop their settlement. 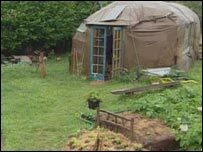 Members bought the 42 acres of land for £50,000 in 2002 after organiser, Totnes teacher Dr Christian Taylor wrote an e-mail calling for people to join the project to create a sustainable community. Current accommodation includes makeshift structures such as benders, a tent-like structure made of poles and tarpaulin, and yurts, wooden trellis-framed structures. Residents produce their own power from solar cells, compost their waste, use water from a stream and harvest rainwater. They appealed against a South Hams District Council enforcement notice and planning refusal in 2006, saying their dwellings had a low impact on the environment. South Hams District Council's planning committee said the development went against council policy.